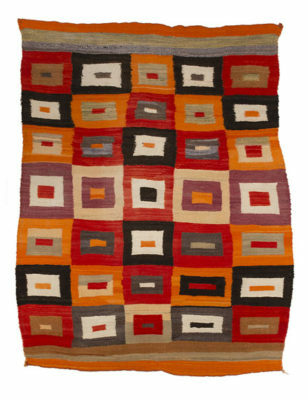 Navajo Transitional textile, c. 1890, Handspun wool, aniline dye, 70 x 54 1/4 inches. Collection of Carol Ann Mackay (photo courtesy of The Heard Museum). The Heard Museum, 2301 N. Central Ave., presents Color Riot! How Color Changed Navajo Textiles, opening on First Friday, April 5, with free admission from 6-10 p.m. The exhibition explores the Navajo culture, individualism and flair for experimentation in textiles from the last quarter of the 19th century. The textiles reflect ideas and events the weavers experienced between 1863 and 1868, the hard years of their imprisonment in the Bosque Redondo, and their subsequent return to a reservation. During this time, weavers saw examples of the design system of Hispanic textiles and acquired new materials such as aniline dyes and Germantown yarns that touched off their experiments with color and design. During this time of great change, as the Navajo rebuilt their flocks and repaired the devastation of Bosque Redondo, weavers had an unprecedented opportunity to experiment. The resulting textiles were not only appreciated by collectors and traders at the time, but future collectors and artists such as Josef Albers. The Heard Museum is simultaneously presenting Albers’ work in the Josef Albers in Mexico exhibition; visitors have a rare opportunity to explore the visual similarities in the use of color, repetition and design between Navajo textiles from the last quarter of the 19th century and the iconic paintings of Josef Albers. Change has always been a hallmark of Navajo textile design, with the weavers’ individualism tied to a continuing theme of innovation. The “Color Riot!” exhibition celebrates the timeless Navajo textiles and is an opportunity to see examples of these colorful and symbolic items that are considered true works of art. The exhibition, which runs through Sept. 29, will feature more than 80 Navajo textiles from prominent private collections including those of Carol Ann Mackay, Steve Getzwiller of Nizhoni Ranch Gallery and the Tony Berlant Collection. For more information about Color Riot! How Color Changed Navajo Textiles, click here.